Once again the Pars scored two late goals. The difference this week was that they were already leading through Joe Cardle’s first goal of the season. An own-goal and a tap-in from Craig Dargo put some gloss on the score line but the match may be remembered more for the ordinate delay in replacing the injured referee. The Pars named exactly the same 16 as had drawn with Morton last time out, which meant no place for Steven Jordan, other than presenter of the prizes for the final of the half-time penalty kick competition, or Ali Whittle. Jordan McMillan continued to captain the side from left-back, with Andy Geggan at right back. Dowie and Morris were centre-backs as usual (Dowie on the right), Thomson, Husband and Falkingham were in midfield (with Cardle on the left wing) and Barrowman and Wallace were the strike-force looking to add to their 14 goal partnership. Paul Gallacher was between the sticks. The Blue Brazil started with a 4-4-2 – the settled partnership of Joe Mbu and captain John Armstrong were in the centre of defence, most of their play was designed to go through their manager, Colin Cameron in the middle of the park, while the pairing of Greg Stewart and the giant Louis Coult would try to breach the Pars defence. Joe Cardle and Jordan McMillan in an overlap that never happened. The Pars kicked off with the tune of Una Paloma Blanca emanating from the 300 or so Cowden fans at the Cowden end. Early attempts to get their passing going were unsuccessful, with Husband responsible for a number of stray passes, before he found his range in the 4th minute with a chip down the line for an offside looking Wallace to run in and test visiting keeper Flynn at his near post. Ryan Thomson is more about strength than subtlety, and after riding a couple of meaty challenges he won a free kick, but Dowie headed Husband’s free-kick over. Cowden too had an early chance when Husband passed behind McMillan allowing McKenzie to get down the line but Stevenson couldn’t keep his shot from the resultant cross down. SHOW BIGOTRY THE RED CARD. This week’s bizarre refereeing incident came early. After reversing a throw-in due to stealing yardage, which probably was fair enough, referee Clancy was taken out by Cameron’s attempted tackle on Thomson, but blew the whistle as Ryan broke, rather than allow play to continue. The official looked like he had picked up some sort of injury, which would have consequences later. Cowden had another half-chance midway through the half when a simple ball into the area from Cameron allowed Coult to turn and shoot, but he didn’t catch it properly and Gallacher saved easily. 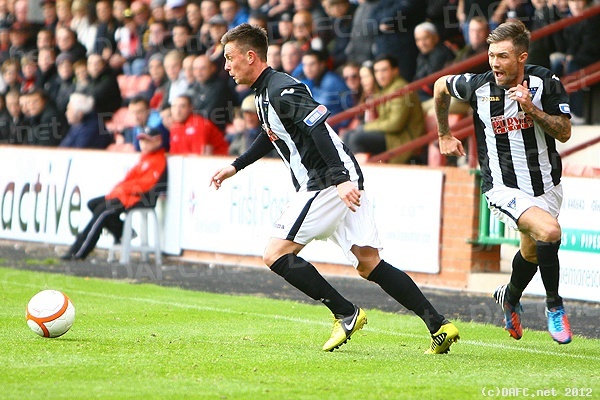 And then the Pars scored, from unpromising circumstances. Geggan was short with his pass-back, and Gallacher was caught in two minds before correctly judging he could beat Stewart to the ball and came from his area to clear. The ball was returned, Geggan headed clear and suddenly Falkingham had the ball and was able to run at the backtracking Cowden defence, before slipping the ball to Cardle on his left. Joe had space to cut inside, and fooled the keeper by slipping the ball in at the near post from 12 yards. 1-0 Pars. 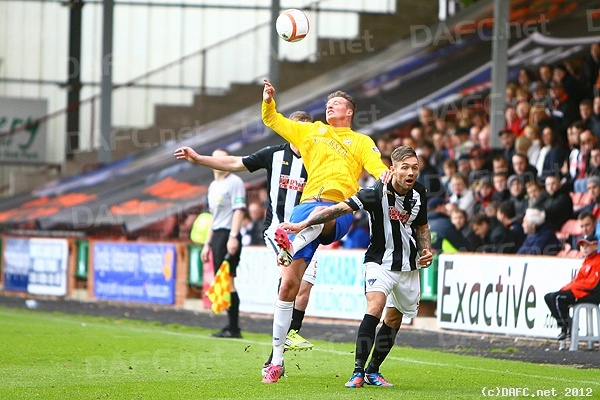 Two minutes later, it should have been 2 as the Pars were awarded a penalty. McMillan had picked out Barrowman’s run towards the corner flag, and when he cut back to Cardle, Joe fed Thomson in the area. His first touch took it away from Armstrong, who mistimed his tackle. However, Husband, who had only just scored from the spot last week, tried to dink it down the middle and Flynn’s trailing leg kept the ball out. 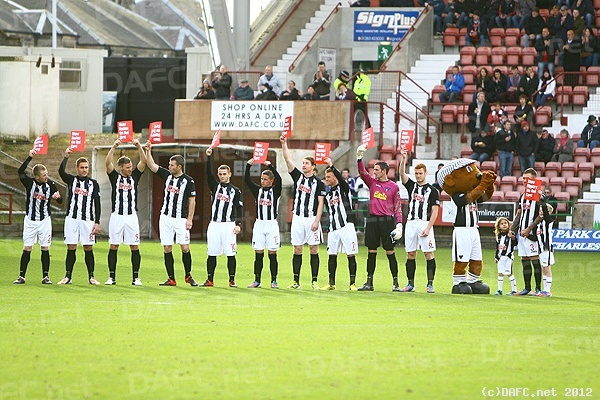 Undeterred, the Pars kept going winning a couple of corners. Falkingham was on them this week, and 10 minutes from half-time he sent one to the near-post, looking for Barrowman, but the ball came straight back. Josh again tried to send it in low, and this time Flynn collected, diving at the feet of Wallace, getting a blow to the face for his trouble. He continued after treatment, but looked a bit groggy, and after he had made a meal of turning aside a straightforward Husband shot, he knew the game was up, and called to the bench to be replaced by Craig Wight. With only a couple of minutes to half-time, the Pars had little opportunity to take advantage of any nerves that the sub keeper might have, although Barrowman did get his head to a Cardle cross, but miscued. After the ominous request over the tannoy (which could be heard quite clearly this week) for any qualified referees to make themselves to the nearest steward, there was a considerable delay before the second half could commence. It was clear that Kevin Clancy could not continue, (the third time in recent seasons that an official had become injured) but apparently four volunteers had been found, who were undergoing a selection procedure. The nature of this procedure was sadly not forthcoming, permitting various speculations, such as an eye-test, a quiz on the laws of the game, or some sort of dance off. Meanwhile, the half-time penalty kick competition was long finished (despite going to sudden death) and the players were out in their tracksuits keeping warm. Noticeably, Paul Gallacher and Brian Potter chose to warm up with the Cowden replacement. Eventually the officials appeared and we were underway, albeit 30 minutes late. The game lasted another 6 minutes before there was another delay, this time to equip the track-suited substitute linesman with a dayglo orange top, although the referee’s grey standard top looked like more of a problem.